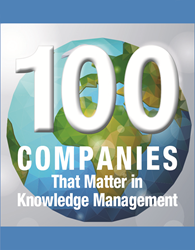 For the fourth year in a row, Comintelli - a leading provider of information access software today announced that they have been selected as one of KMWorld’s “100 Companies That Matter in Knowledge Management” for 2016. Being named to our list of 100 Companies That Matter in Knowledge Management is a prestigious designation because it represents the best in innovation, creativity and functionality. As selected by KMWorld's editorial staff, the list identifies companies who are leading the way in the Knowledge Management market through their velocity of innovation and impact on the market. “We are extremely proud that we have been recognized by KM World! This is a fantastic acknowledgement of the Knowledge Management software we have developed, and encourages us even more to bring innovative KM solutions that helps organizations break down information silos and manage the explosion of unstructured data” says Jesper Martell, CEO of Comintelli. The list is compiled by KM practitioners, theorists, analysts, vendors, their customers and colleagues and can be found in the March issue of KMWorld, and online on http://www.kmworld.com. KMWorld (http://www.kmworld.com) is the leading information provider serving the Knowledge Management systems market and covers the latest in Content, Document and Knowledge Management, informing more than 30,000 subscribers about the components and processes - and subsequent success stories - that together offer solutions for improving business performance.